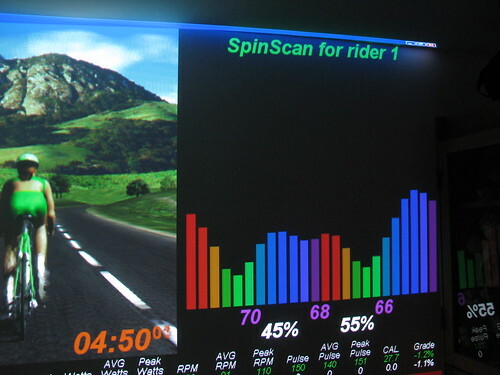 One of the interesting aspects of the CompuTrainer is the SpinScan. I’m not sure quite how it’s done, but the system measures the torque applied to the pedals at each point in the compass. The visual display gives you an idea of the efficiency of your pedal stroke – an ideal pedal stroke would show a perfectly level distribution of power at all points of rotation (this is how Titanium Man rides). 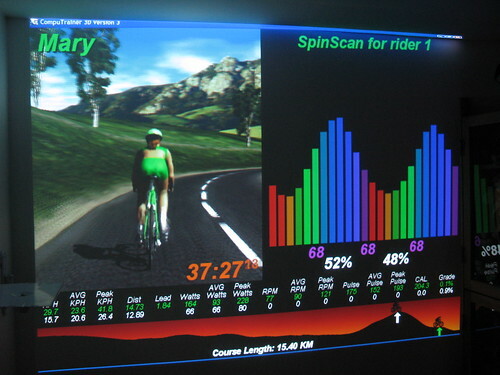 This is a SpinScan from the start of Mary’s ride this morning. The blue bars are the downstroke, green is across the bottom, yellow is the upstroke, and red is pushing across the top of the pedals. This next scan shows the effect of pushing hard across the top of the pedals (the red bars have come up). You can feel the different muscle groups when you do this – the hip flexors aren’t accustomed to these demands. Finally, here she’s going all out for a finish at the bottom of a hill. She’s pushing 164 watts with a good distribution of power. Posted by Kern on January 23rd, 2011. That's quite an amazing machine. I can't say that I've ever given any thought to cadence, power output etc tho I am vaguely aware that my right leg does most of the work, the left just seems to go along for the ride! 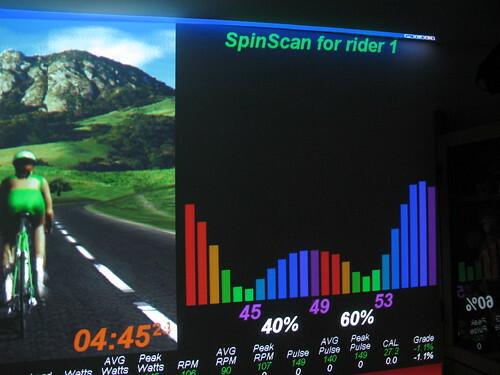 SpinScan looks good for training. I don't pay any attention to cadence either, and I've no idea what my pulse rate is riding my bike. At rest, it's around 58 and always has been I think. I see Mary's went to a peak of 193 at the push to the finish. That seems impressive. Isn't the idea of oval chainrings that they should even out the distribution of energy expended? Or torque applied or whatever to maintain an even cadence? Does Titanium Man ride a bike with virtual EggRings? I think we should be told. Mary's went to a peak of 193. Yes, it is impressive. Mary has incredible aerobic capacity. She took a vo2max test a couple of years ago in which her heart rate peaked at 205. Her aerobic threshold is somewhere around 190. However she doesn't like to let herself go to those extremes because of high blood pressure. Does Titanium Man ride a bike with virtual EggRings? Good question, Chris. It sure feels like it when riding against him. I find I have to expend at least 20-30% more energy than him just to stay even. I would very much like to get an EggRing and try it out on a SpinScan. My head tells me the EggRing should improve the overall efficiency of the pedal stroke. Kern wrote: I would very much like to get an EggRing and try it out on a SpinScan. That would settle the matter once and for all, wouldn't it?